For some, talking about age-related issues can be a walk in the park. But for others, it's either not on their radar or a conversation they'd rather avoid. 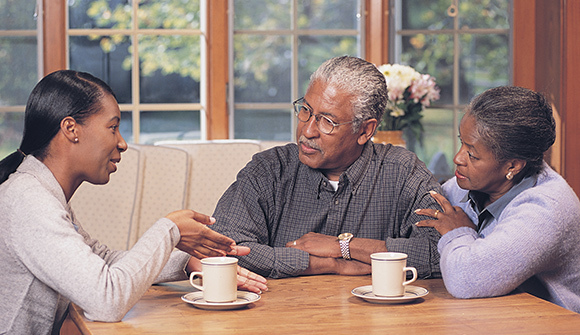 The HHS Aging Services Coordination office understands the importance of these issues and has developed the Texas Talks campaign to help get the much-needed conversation going with loved ones. "Those important conversations aren't being had until an event happens such as a fall or stroke," said Holly Riley, manager of the office. "It's part of our charge to help people address these things." Texas Talks is an extension of the office's Age Well Live Well community engagement initiative. "The goal is to be positive and preventive and help families prepare for aging issues and needs which may arise later," said Will Armstrong, the office's marketing director. Armstrong's background in geriatric social work revealed a recurring theme of adult children thinking about how to care for their aging loved ones. He said this topic came up many times when counseling family members after a health-care crisis. The office proposes that the Texas Talks campaign be used around the fall and winter holidays, when most families are gathered together and have these important conversations. The program also advises how to approach loved ones in a respectful, empathetic way and how to handle sensitive issues. "We're about putting a positive face on aging. We want families to proactively prepare for assisted living, take legal actions today, that sort of thing," Armstrong said. "We need to start having these conversations with our parents. It's usually a conversation that doesn't happen because it is viewed as taboo — children taking care of their parents. These are topics that need to be discussed." To learn more, go to Texas Talks webpage. For questions, call 800-889-8595 or email TexasTalks@hhsc.state.tx.us.